The Araucana chicken breed originated in the Arauca region of Chile. They were raised by the Araucana Indians and are believed to be a cross between chickens and pheasants. The Araucana breed as it is known today was first developed by Dr. Ruben Bustros of Chile. He crossed the two breeds over a period of years and developed the rumpless, tufted bird that lays blue eggs. His breed was first introduced to the World Poultry Congress in 1918. They were accepted as an official American breed in the late 1970s. Caring for this unusual breed is easy, which is why many children raise them for 4-H projects. Keep your chicks warm, safe and well fed. 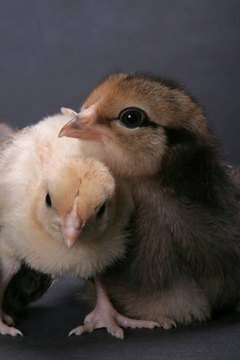 Small chicks need to be kept in a brooder, which will keep them warm like a mother hen. A brooder uses a heat lamp to maintain a constant temperature for the chicks. A heat lamp should be adjustable so that it can be moved up or down in order to adjust the temperature. A thermometer can help owners ensure that the temperature remains around 95 degrees F for the first two weeks, then subtract five degrees each week until it reaches 70 degrees F. At this point the heat lamp can be removed. The brooder should be at least one foot high and allow each chick three to four inches of space. Brooders may be purchased commercially, or a child's swimming pool can be pressed into service. The brooder should be placed in a draft-free area that is safe from predators. The floor of the brooder should have a type of bedding that is easy to clean, such as small wood shavings or newspaper. It should be changed at least twice a day. Fresh water should be available at all times in a shallow waterer so that the chicks cannot drown in it. Chick starter that is lightly "salted" with chick grit should be available at all times. Be prepared when your chicks exhibit aggressive behavior. One of the signs of a crowded pen is picking, which is when the chicks begin pecking at each other, causing bleeding and leaving them susceptible to infection. Treat any victims of pecking with bacitracin ointment. If pecking becomes a constant problem, consider buying a red brooder bulb and toss a few grass clippings into the brooder pen. The bulb makes it harder for them to see wounds on other chicks, and the grass clippings will keep them occupied. Know what to do to combat and prevent illness in your young flock. There are two illnesses that you should be aware of when raising your Araucana chicks. The first is coccidiosis. Many hatcheries will inoculate the chicks against this disease before they leave the hatchery. Another way to protect them from this disease is to feed them chick feed that has the medication already in it. The second problem facing baby chicks is called pasting up. This occurs when the chick is stressed and has runny stools. If left unattended, the stools can harden up on the baby chick, making it impossible for it to pass any more stools. This can kill your chicks. If you notice this happening, wet a paper towel with warm water and carefully clean off the affected chick. Do this as necessary until the chick's stools become normal again. Prepare your chicken coop to receive maturing chickens. The chicks will begin to mature at 18 to 24 weeks. The young hens, or pullets, will mature first and the cockerels will mature a few weeks later. It is important to separate the hens from the cockerels once they've matured for two reasons. First, too many cockerels may result in a lot of fighting and injury. Second, if you plan on breeding your chickens, you'll want to breed specific traits, which is easier once you know which hens and cockerels in your flock have the breed traits. These traits are blue eggs, tufted ears and no tail (or rumpless). A general rule of thumb is one cockerel per eight hens in a coop. The cockerel may be removed and placed in a separate coop any time you don't want fertilized eggs. Keep your chickens happy with the right food and clean living quarters. Mature chickens will need a different type of feed, one that is made for layers. They will also need chicken grit sprinkled on their feed each day and a fresh supply of water. Their coop should have plenty of dry bedding, which can be wood shavings, straw or hay that is changed regularly. Dirty bedding can lead to disease and attract unwanted insects in your coop. Chickens enjoy foraging, so when possible allow them to be free-range chickens. However, be sure to put them in a coop at night to protect them from predators in your area.